So it was finally time to open and drink my flight of St Clement's Oroppas wine (info on 2007 bottling). It's been waiting too long, so the wife and I decided to cook a wonderful dinner and start popping open bottles. My oldest bottle was from 1995. Waiting 17 years is certainly too long, but what's done is done. The 1995 still had a lot of flavor, rich notes, but with a very short finish (as expected). Sunday night, we opened up the first four bottles (1995, 1996, 1997, and 1998). Since these bottles were old, I figured they wouldn't be strong representatives of Oroppas. So... I also opened up a 2007 Oroppas; the tasting notes said it was just getting ready to drink. 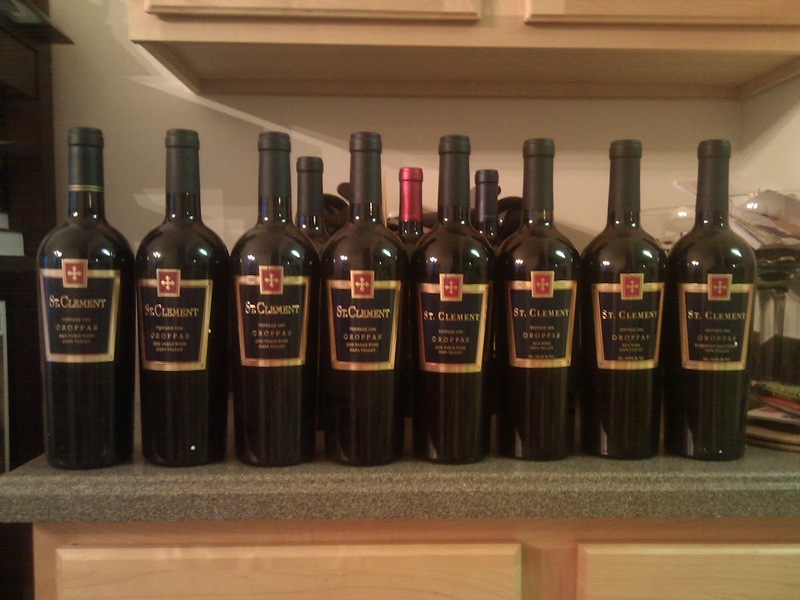 The 2007 was our "control" bottle to really show the bold, smooth flavors of St Clement's Oroppas series. As I mentioned, the 1995 was still good, but with a short finish. The 1996 was tasty, starting to show some of Oroppas' deeper flavor. Strangely enough, the 1997 was a step backwards. The wine was a bit sharp and acidic, unlike the big bold flavor of the 2007. Even the 1996 demonstrated some of that boldness. Given the usual success of Napa wines from 1997, I was quite surprised. Thankfully, moving onwards to the 1998 put everything back on track. The 1998 was a good representatve of that Oroppas flavor and style. Bold and smooth, with lots of rich flavor and a great mouth feel. The 2007 had even more flavor, but still contained some of the rough tannins of a young wine; the 1998 had none of that roughness and much (though not all) of the flavor. I will probably wait at least two or three years before opening more of the 2007, to age away some of the tannins. By mid-evening on Monday, we had finished off the 1995, 1996, and 1997. 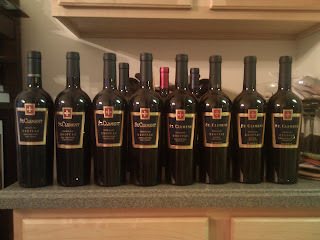 We kept around some of the 1998 and the 2007 for comparison, as I popped open the 1999 and 2000. The progression from 1998 was quite obvious with the 1999 wine -- the flavor and finish just got bigger. But the 2000 was missing the strong berry and fruit undertones, leaving just a woody finish. The 1999 was the clear winner in these few years. Tuesday night, we opened the last two... the 2001 and 2002. This pair was very similar to Monday night's bottles: one smooth and full-bodied, and the other was a bit less. The 2001 was excellent. It had all the favor, smoothness, fruit and berry, and richness expected. The 2002 was a bit weaker on the fruit and the tannins were starting to creep in. Overall, please remember that I'm talking comparisons here. All of these bottles were very tasty. There is just no way to call any of these bad wines. As expected, the 1995 had weaker flavor yet no tannins. Moving forward in time, the flavor definitely improved, but the true Oroppas boldness did not show up until about 1998 or so. Around 2001 or 2002, a light shade of tannins started to arrive. The 2004 seemed to be the peak in the bottles that I had. I've been a club member of St Clement for 10 or 15 years. Their whites, reds, and specialities like the Oroppas are all fabulous wines. Their winery is a big Victorian up on a hill; it is beautiful, with a wonderful view over Napa Valley. I'm definitely a fan, and this flight has been an awesome experience. I highly recommend their wines, and a visit to their wonderful property. Lately, I've been fascinated watching the show Hoarders on A&E. The show is like a train wreck -- you just can't stop watching. It is a bit sad once you truly understand that hoarding is a psychological disorder, but it is so hard to stop watching. The things that people collect, that get hoarded, the condition of the house, etc ... there is always something new on the show. But here is where the "Stuff" from my post title comes in. There are a number of shows on that focus on "stuff". Hoarders is one show, but TLC has a similar show named Hoarding: Buried Alive. The show title is a bit crazy, given that it actually happens. It doesn't stop there. Those two shows are about people collecting. But there are shows on the other side of the equation, too. Hoarding is about acquiring, but the stuff (sometimes) needs to go away, too. Storage Wars is about lockers that get auctioned off when people don't pay their bill. In many cases, the lockers were owned by hoarders, and all kinds of awesome stuff is found in there. And then you have the show, American Pickers. The show is extremely fascinating. Mike and Frank find lots of stuff in peoples' hoards, but they concentrate on old items, and the history behind them. As a big History Channel fan, American Pickers is an interesting lens into history. Old cars, music legends, bicycles, cars, and other memorabilia. The stuff that people accumulate is incredibly fascinating, and these shows provide a broad view into history, people, and an endless variety of "stuff".